Reports on what Lone Pine Land Trust has been doing. Chris Ketola, and avid naturalist and educator with our friends at the Willow Beach Field Naturalists, led a very well attended bat walk at the Lone Pine Marsh on the evening of September 16th. After some introductory remarks about bats, their life history, and the severe conservation issues they presently face Chris produced an amazing piece of technology called an Echo Meter Touch. This small gadget plugs into an iPhone and can then detect the ultra high frequency sounds made by bats flying overhead in the darkness! This device records the frequency, pattern, and amplitude of bats sounds then reproduces them in visual and audible representation within our hearing range allowing for species level identification. Sure enough as darkness fell the bat sounds began and based on the characteristics of the calls heard that night we found both Hoary and Big Brown Bat hunting for insects over the Bobolink fields. In a previous visit to the site Chris also found Silver-haired Bat. In fact Chris visited several of our properties this past summer and gathered some initial data on bats living on the lands we protect – something we know very little about. On September 9, Doug McRae and Paulette Hebert attended Prairie Day on behalf of the Lone Pine Land Trust. Prairie Day is an event hosted by the Alderville Black Oak Savanna and the Rice Lake Plains Joint Initiative to raise awareness and provide education to the public about prairie and savannah habitat that surrounds Rice Lake. Doug and Paulette greeted guests at the Lone Pine Land Trust information booth and provided information on the properties we protect, membership and opportunities to donate land or make financial contributions. The public was also encouraged to visit accessible Lone Pine properties such as the Braham Tract on Maple Grove Road. Other members of the Rice Lake Plains Joint Initiative were also on hand with information and freebies like books and stickers. It was a great opportunity to meet and network with like-minded organizations. A host of fun and informative activities were also offered by the Alderville Black Oak Savannah and a number of other participants. There were guided tours of the Prairie, demonstrations about the cultivation and preparation of local wild rice and acorn flour, entertainment such as the Sugar Island Singers and a puppet show for the kids. There were also reptiles, bird banding, bees, plants and plenty of great food including scones, indigenous style. What a perfect way to get your dose of nature! Many thanks to the Alderville Black Oak Savannah for all the work they put into Prairie Day, it was a great success. In April 2017, 30 Grade 9 students from Cobourg Collegiate Institute ventured into the marsh for a full day of work, education and fun sponsored by the Lone Pine Marsh Board and a grant from the Trillium Fund. The weather was hot and sunny and made for an amazing day to be outside and enjoy spring. During their time at the marsh, the students participated in 5 workshops which included: installing 15 bird boxes; planting 200 trees throughout the property; examining water quality and discovering water borne species in the marsh; identifying a variety of invasive species that need controlling such as dog strangling vine, buckthorn and Manitoba maple; and finally learning about grassland management to encourage bird species to return to the area. Students put up bird houses at Lone Pine Marsh – Braham Tract on April 27, 2017. 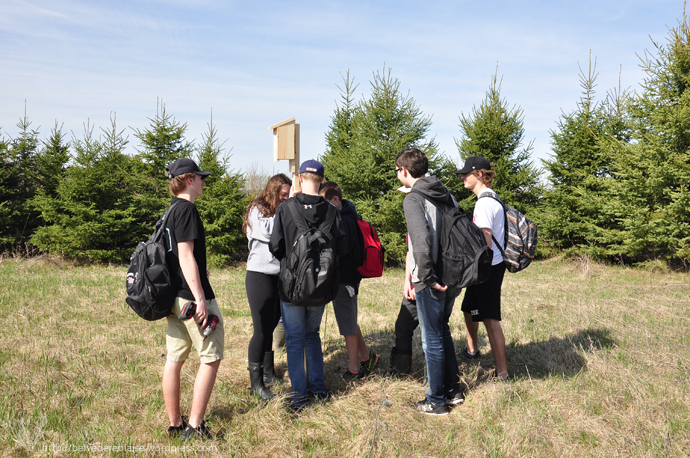 Prior to the event, students built the bird houses in the wood shop at CCI and then installed them at the marsh. Hard work quickly turned to excitement as the students saw birds begin to take over the boxes before even completing the installations. Various other sightings of wildlife happened during the day: deer wandered through the area, numerous species of birds circled the birdboxes, and a garter snake was captured and subsequently released. The students found this educational day exciting and challenging but intermixed with a lot of fun. Members and friends of Northumberland and Lone Pine Land Trusts attended Dr. Erica Nol’s talk on February 16 at the Cobourg Public Library entitled, “Can humans and songbirds coexist in southern Ontario.” Dr. Nol is a professor at Trent University and along with her graduate students, she studies influences on bird population dynamics. Dr. Nol first put her talk in context; birds compete with humans for lands that are converted into more and more houses. Woodland song birds such as Veery and Rose-breasted Grosbeak are facing mild declines while grassland birds like Bobolink and Field Sparrows are showing steep declines. Common native birds such as Robins, Grackles, and Brown-headed Cowbirds are increasing. As examples, Dr. Nol expanded on various studies she has participated in that focus on songbirds in forests or grasslands including: Ovenbirds, the impact of trails on songbirds, Bank Swallows, Brown Creepers, and Bobolinks. The ovenbird nests on the ground and their success is related to the abundance of their invertebrate food source. The research found that larger woodlots have more ovenbirds. This is related to lower temperature, higher moisture, and less wind in larger woodlots. Large woodlots are therefore better for maintaining ovenbird populations. Next Dr. Nol highlighted research conducted in the Northumberland Forest that related trail width to abundance of forest-interior songbirds. When trails were wider, the researcher was less likely to hear songbirds, especially compared to areas that did not have trails. Nest success of Eastern Wood Peewee was less in pine plantations compared to deciduous forests and was positively influenced by forest gaps. Early thinning of pine plantations that results in faster deciduous regeneration is advantageous for this species. The Bank swallow, a threatened species in Ontario, can reproduce in aggregate pits with appropriate soils. Compared to the Lake Ontario lakeshore, the abundance of nests was lower in aggregate sites but clutch and hatchling number were similar. Gull predation was higher at the lakeshore sites. Brown Creepers nest under bark. A study conducted in Algonquin park found that any tree harvesting reduced numbers of creepers but populations were more likely to be sustained when yellow birch trees were left standing. In a study examining rotational grazing effects on Bobolink, any grazing reduced the bobolink population by half (cattle were good at trampling nests). Cattle in larger fields with lower stocking densities had a lower impact but Bobolinks had the greatest reproductive success in hay fields that were cut after July 1. I found Dr. Nol’s explanation of impacts of humans on various aspects of songbird success to be enlightening. The research examples presented demonstrated the myriad of ways that birds are influenced by our development. While Dr. Nol did not truly answer whether humans and songbirds can coexist, it is clear that human choices have often unlikely impacts. Lone Pine Land Trust attends events in the community to reach out to potential members and support local events. Here are photos of us at some events we participated in 2016. Earl Arsenault, property steward (right), at For the Love of Wood (Hilton Hall), May 2016. Gary Bugg (left) at Codrington Farmers’ Market, Aug 2016. Sara Kelly and Dalila Seckar at Prairie Day (Alderville Black Oak Savannah), Sep 10, 2016. Speaker attendees at Keeler Centre, Nov 17, 2016. If you have a suggestion of where we should bring our display, let us know!